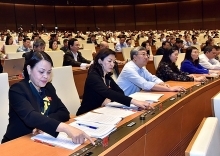 Legislators examined the results of the inspection of the implementation of the national target programme on new-style rural areas for 2010-2015 in combination with agricultural restructuring during their plenary session on November 4. According to a report presented by the National Assembly Standing Committee, thanks to the program, rural areas have been given facelifts, especially in terms of their transport systems and social infrastructure. So far, 2,061 communes or 23% of the total communes and 27 districts nationwide have been recognised as new-style rural areas. The proportion of communes having met the criteria on planning, security and social order, electricity, education, irrigation and income has improved significantly over the past five years. The household poverty rate dropped from 17.4% in 2011 to 8.2% in 2015. Per capita income in the modern communes rose from VND16 million (US$720) to VND28.4 million (roughly US$1,280) per year during this period. Between 2010 and 2015, more than VND851 trillion (US$38.3 billion) was mobilised for the programme. 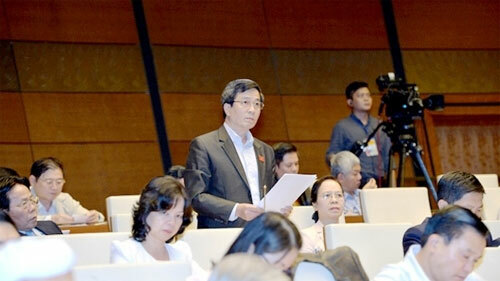 The legislature had also allocated VND15 trillion (US$675 million) sourced from Government bonds for the work during the 2014-2016 period, the report said. At the same time, the agricultural restructuring project has helped raise farmers’ incomes, shift the labour structure in the farming sector and develop new rural areas sustainably. However, the parliamentary inspection delegation pointed to limitations in the work, including the big gap between set standards and the particular conditions in various regions, areas and locales. The slow issuance of documents guiding the realisation of national criteria on new-style rural areas also hindered the implementation process. The Prime Minister’s Decision No. 800/QD-TTg dated on June 4, 2010 aimed to see 20% of communes recognised as new rural areas in 2015. However, this target was not realised, the inspectors said. Moreover, there is a big gap in the proportions of new-style rural communes among regions, with 46.4% recorded in the Southeast region, 42.8% in the Red River Delta, 8.2% in northern mountainous locales, 13.2% in the Central Highlands and 16.7% in the Mekong Delta. A serious problem in the implementation of the new-style rural area programme is the large outstanding debts incurred by local authorities, mostly in capital construction, which has amounted to VND15.2 trillion. Localities in the Red River Delta and the North Central region accounted for 75.3% of the total debts. In addition, many locales have not realised the importance of agricultural restructuring in the building of new-style rural areas. Therefore, they have been slow in building and carrying out projects aimed at restructuring agricultural production. Others have failed to include the restructuring project in the new-style rural area programme. The role of cooperatives had not received due attention, the inspectors stressed. Given this, they suggested the Government continue keeping a close watch on the application of the criteria during the 2016-2020 period for timely adjustment. They also underlined the need to promptly issue documents guiding the implementation of the programme in detail. The Government should draft supplements and adjustments to laws regarding agriculture and rural areas and submit them to the National Assembly in order to facilitate the building of rural areas and agricultural restructuring, they said. To address the outstanding debt, the Government should prioritise allocating capital to local administrations to pay off debts before starting new projects, and build a roadmap to pay off all debts before 2019 while preventing any new debt from arising. The inspectors also suggested initiating more policies to encourage businesses to invest in rural areas as well as start-ups in agriculture and to connect farmers with the State, businesses and scientists. Land-related polices should be reworked in order to step up large-scale production while ensuring land-use rights for farmers, they said./.